UPDATE: Police have attended the scene of two break-ins in which glass panels from storefronts at the Chapman shops were smashed in at around 12.19am this morning. Police attended the scene within two and a half hours of receiving calls from the affected stores. They are calling for anyone with information in relation to the break-ins to contact Crime Stoppers. 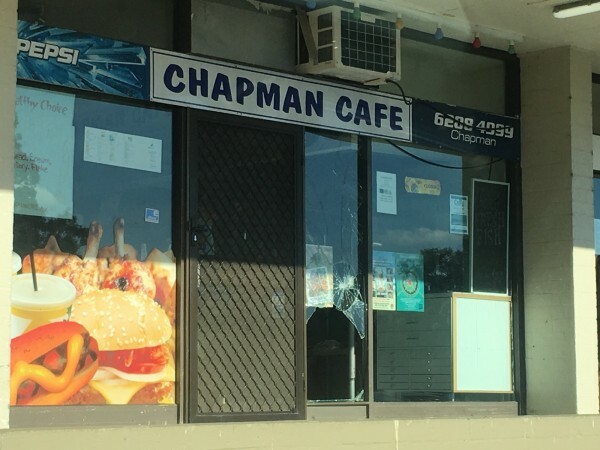 Chapman cafe owner Samson Dass arrived at work this morning to find his takeaway outlet had been broken into overnight, and is frustrated that he is unable to serve customers today as police have yet to arrive and have requested he not touch anything until they do. Neighbouring business Cool Pools of Canberra was also broken into, and was alerted to the break-in via the alarm system at 12.19am. Nothing was stolen from either store. One glass panel was smashed to the right of the main entrance to the Chapman Cafe, which is a food outlet and takeaway specialising in fish and chips, burgers, pizza and seafood. 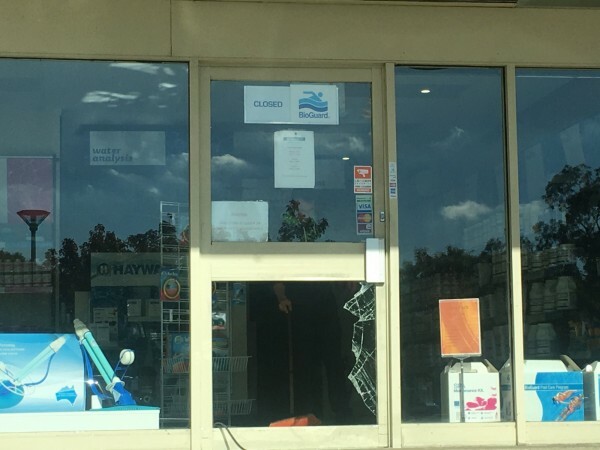 The lower panel of the glass front door of Cool Pools of Canberra’s Chapman store was also broken. Mr Dass was clearly frustrated by his predicament when the RiotACT spoke to him at 10.30am this morning, with the tradies-driven lunch rush due to begin in an hour’s time and uncertainty about whether he’ll be able to serve up their meals. “I’m really annoyed, the police should be here,” the takeaway operator said. Cool Pools of Canberra Chapman store spokesman Jared Shore said nothing had been taken from the pool supplier’s premises either. They are open for business as the ACT Policing officer he spoke to this morning provided different instructions to those given to Mr Dass, saying it would be fine to clear up the broken glass. Mr Shore expects the door panel to be replaced today. The RiotACT contacted ACT Policing to ask when police would attend the scene and why there were delays in such situations. A spokesman explained that police are required to triage their responses. “I understand people being annoyed/frustrated but jobs that require immediate response to ensure public safety will be given higher priority,” the spokesman said. It was not possible to provide an estimate of when officers would attend a crime scene because their schedule was dependent on other calls received throughout the day.